Today.Az - Why Arab tourists prefer Azerbaijan? Why Arab tourists prefer Azerbaijan? The new Strategy of the State Tourism Agency envisages opening of foreign offices in Arab countries with the aim to further strengthen Arab tourists' interest in Azerbaijan. Last week, the capital hosted a landmark event - the first National Tourism Summit organized by the State Tourism Agency and the Tourism Bureau of Azerbaijan. More than 1,500 representatives of government agencies, the diplomatic corps, the tourism sector, local and foreign partner organizations, and the public took part in the event. There, the strategy of the State Tourism Agency was announced, a national tourism brand was presented. Chairman of the Azerbaijan Tourism Association (AzTA) Nahid Baghirov told Day.Az that the country leads in Arab tourism, adding that the prospects for the development of tourism are promising. He noted that the number of tourists visiting Azerbaijan is steadily growing. "In a short period of time, starting from 2016, we understood who a tourist is. We did it. People didn’t think about it, did not believe. You can see for yourself what a large flow of tourists Azerbaijan has received since 2016. But we must continue to work on this, not to 'relax'. For example, new tourist destinations are opened every year, and thus we have competitors. This is a cruel world where there is competition. Therefore, you cannot sit still, you need to invent something new," said Bagirov. As for Arab tourism, the Association is working together with the Ministry of Tourism in this direction. "According to the new Strategy, it is planned to open offices in Arab countries. This is very important if we want to continue to see Arab tourists," the head of AzTA said. Bagirov named Turkey, Central Asia, Malaysia, Singapore and Thailand “fierce” competititors to Azerbaijan in this area. "We need to take into account that countries spend big money to attract tourists. We need to do something new so that tourists come to Azerbaijan. In addition to advertising the country abroad, everything must be done inside so that tourists do not get bored, spend their time in an interesting way. We need to develop the infrastructure. Considering that many come with families, it is necessary to open more places to entertain children. We must work hard. Azerbaijan has a great potential for the development of this sphere," he concluded. In January-September this year, 2,208,600 foreigners and stateless persons from 193 countries arrived in Azerbaijan, which is 6.4 percent more compared to the same period last year. Some 31.2 percent of those who arrived in Azerbaijan are citizens of Russia, 19.8 percent - Georgia, 10 percent - Turkey, 9.2 percent - Iran, 3.3 percent - the United Arab Emirates, 3 percent - Saudi Arabia, 2.7 percent - Iraq, 2 percent - Ukraine, 1.5 percent - Israel, 17.2 percent - other countries, 0.1 percent - stateless persons. 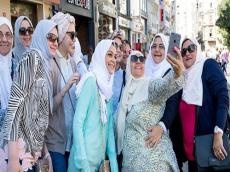 In total, 467,800 people arrived from the countries of the Persian Gulf, that is, almost every fifth tourist was a citizen of these countries. During the period, the number of tourists from EU countries increased by 8.9 percent, reaching 88,900 people, from CIS countries - by 4.7 percent, reaching 813,700 people.